Overhead assists and enhances patient mobilization and reduces workers’ compensation claims associated with patient handling. This transfer system is the most versatile lift system available, designed to help patients out of bed and into a wheelchair or shower/commode chair. This product is available in 750 or 1000 lb. weight capacity. 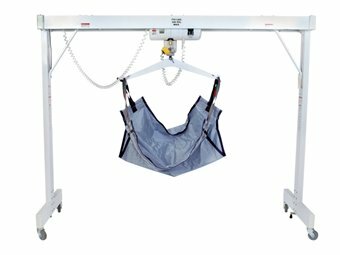 The Powerlift 1000 OVER Bari Lift and Transfer™allows lifting from the floor level and creates a safer environment to properly transfer the patient while protecting caregivers from injury. Available options include built-in scales and multiple sling types to choose from, including commode slings. Helps reduces patient and staff injuries that may occur during transfer. Heavy-Duty frame with expandable base is tip-resistant for patients and residents up to 1000 lb weight capacity. 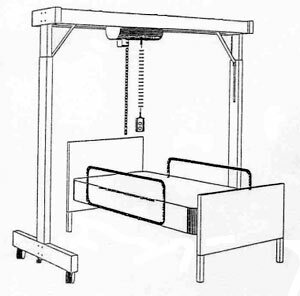 Lifting height adapts from the floor to the highest hospital beds. Features simple push button operation hand control for ease of use. Digital scale up to 1000 lb weight capacity (optional). Before unpacking; Check for visible signs of damage which should be reported below. 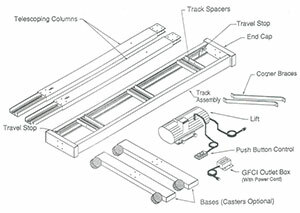 If no damage is observed, carefully remove the packaging material from the Track Assembly and Support Structure Components. Note: Any damage or shortages must be reported immediately. 2. 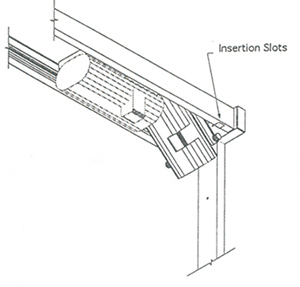 ATTACH COLUMNS TO BASES - Begin by assembling each support column to its base. Insert the smaller section of the telescoping column into the opening at the upper center of the base. Complete assembly of each column and base by inserting and securely tightening four (4) button head screws. 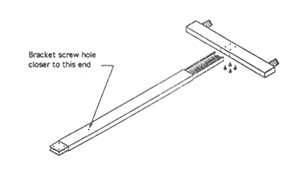 Assemble the first column to the track assembly by inserting the steel tie plates projecting from the top of the column into the center opening of one of the end caps (be sure that the tapped bracket screw hole in the upper portion of the column faces inward to receive the corner brace screw). Complete assembly by inserting and securely tightening four (4) button head screws in a similar manner as the base assembly. 4. 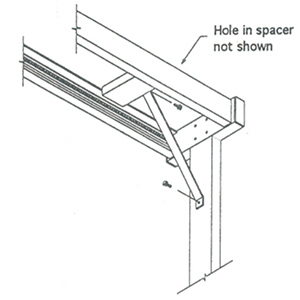 ATTACH SECOND COLUMN TO TRACK - With the help of another person assemble the second column by lifting the track and inserting the steel tie plates projecting from the top of the column into the center opening in the end cap (be sure that the tapped bracket screw hole in the upper portion of the column faces inward to receive the corner brace screw). Complete assembly by inserting and securely tightening four (4) button head screws in a similar manner as the base assembly. 5. ATTACH FIRST CORNER BRACE - Attach the first corner brace to the column and the outermost track spacer using two (2) hex bolts provided (Attach this brace opposite the end with insertion slots on the bottom of the rail). It may be necessary to loosen the four track spacer screws for minor repositioning to align bolt holes (“MOVING A SPACER”). Securely tighten the hex bolts on the track spacer and the column. 6. 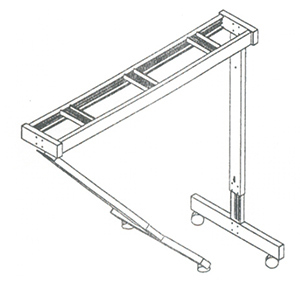 INSTALL THE LIFT - Prior to assembling the second corner brace, install the lift into the track assembly. First loosen the track spacer and slide it out of the way (“MOVING A SPACER”). Be sure that the power supply cord projecting from the end of the lift faces the end with the GFCI outlet box. Install the lift by inserting one pair of wheels into the bottom insertion slots and rolling the unit a few inches towards the opposite end. Then rotate the lift upwards until the second pair of wheels swing up into the insertion slots. 7. 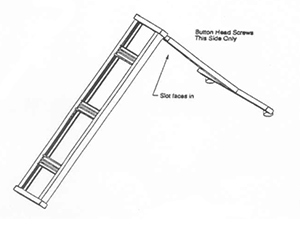 ATTACH THE SECOND CORNER BRACE - After rolling the lift and trolley toward the center of the track, install the second corner brace in the same manner in step 5. SECURE THE TRAVEL STOP - Position the Travel Stop as shown in the figure (below left). Bottom of stop should angle away from track slot or End Cap and toward the Lift. Securely tighten this bolt. The second Travel Stop should be positioned on the opposite end of track assembly in a similar manner to prevent lift from striking opposite corner brace. 9. RECHECK ALL SCREWS - All screws should be rechecked to ensure they are tightened securely to a torque of 125-150 in-lbs (12-15 lbs pull at the end of a 10” wrench). 10. ATTACH THE GFCI OUTLET BOX - Attach the GFCI outlet box to the appropriate End Cap using the two (2) top socket head screws as illustrated. Plug the power supply cord from the side of the lift to the GFCI outlet box and snap the power supply cord plug retainer over the cord plug to secure the same. 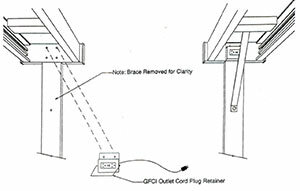 Adhesive mounted clips may be attached to the support column as desired to keep the GFCI outlet box power cord secured and out the way. 11. PLUG IN THE GFCI OUTLET BOX - The lift must be connected to an appropriate 115 volt, 1 phase, 60 Hertz, grounded power source to provide power for the lift. Remove the Hairpin from the Clevis Pin and remove the pin. Place the spreader bar in the Clevis opening so the Clevis Pin can pass through the hole in the center of the Spreader Bar then replace the Hairpin. Remove the Hairpin from the Clevis Pin and remove the pin. 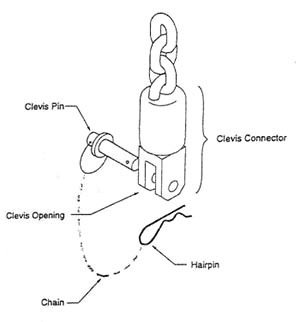 Place the ring of the Hugger into the Clevis Opening so that Clevis Pin can pass through the ring, then replace The Hairpin. 1. 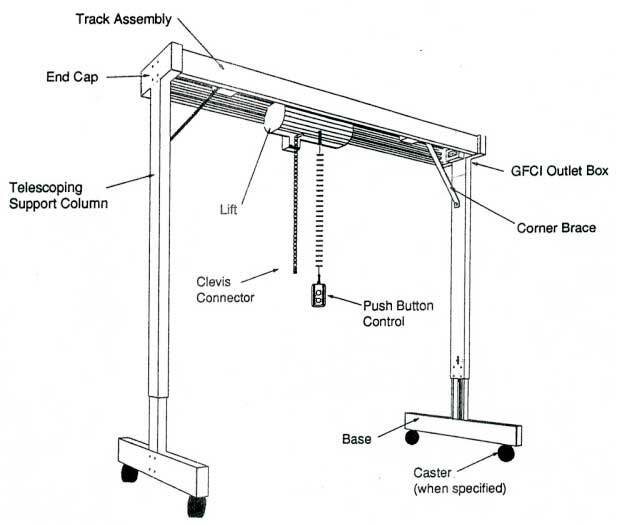 Secure The Hoist: Move the hoist to the opposite end of the column being adjusted and have a second person hold it in place while height adjustment is made. 2. Adjust The Height: Loosen the Incremental Adjustment Screw with a 9/16” wrench while supporting the upper section with one hand. 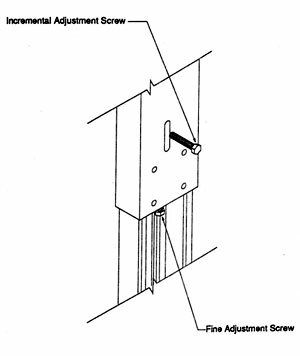 Continue to loosen the screw to allow the section to become unlocked and free to move. Raise or lower the track to desired height but not more than 6” at a time (93” max height of track). Securely tighten the screw making sure the holes are aligned. 3. Repeat the procedure: Repeat steps A & B to adjust the opposite Column. Take care not to raise or lower a Column more than 6” above opposite Column. Repeat this cycle until desired height is reached fro the track (93” max height of track). 4. 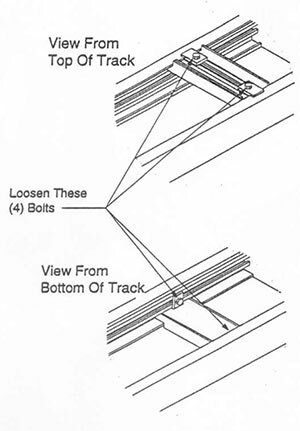 Level the track: Loosen one to two turns but do not remove the Incremental Adjustment Screw. Then using the Fine Adjustment Screw adjust the height on one side to level the track (clockwise rotation raises track). Securely tighten both the Incremental Adjustment Screws. Position the lift over the bed with the centerline of the lift over the midsection of the person to be transferred. Also position the track offset so that sufficient space is provided to place the wheelchair between the bed and a support column. 2. Roll patient away from attendant. Place folded sling along length of patient as close to back as possible with lower edge of sling slightly below Knees. Roll patient back toward attendant and open sling fully. Roll patient back so they are centered along the length of sling. Slide one metal sling bar into each pocket of the sling. Using the chain, attach the "S" hook into the sling bar. The Opening should face away from the patient. Center lift over the patient. Lower the spreader bar so that a single chain link can be attached to each side (approximately the 9th link) from the shoulder. Make sure that the spreader bar is inserted into a single chain link. When you push the up button, check to ensure patient is seated correctly and is not pitching forward. If patient is pitching forward, return to starting position and make adjustment. If patient is positioned properly, continue to raise them to a point that they can be moved across the track and positioned over the chair. Lower patient, guiding them into their chair by gently pushing on their knees. When patient is seated and chain is slightly slack, detach "S" hooks from metal bar in sling, raise the lift using push button control and send unit off to side. Weight Capacity . . . . . . . . . . . . . . . . . . . . 750 or 1,000 lb. WARNING - If you fail to heed this warning, a fall may occur and cause severe injury to you or your attendant, and may cause damage to this lift and to other property. 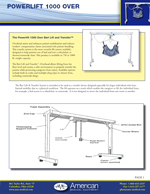 The weight capacity of this lift is 750 or 1,000 lbs. Exceeding this limit will also void the warranty.